This clever design calmly reflects upon two seasons in the cairngorms national park, Spring and Summer. 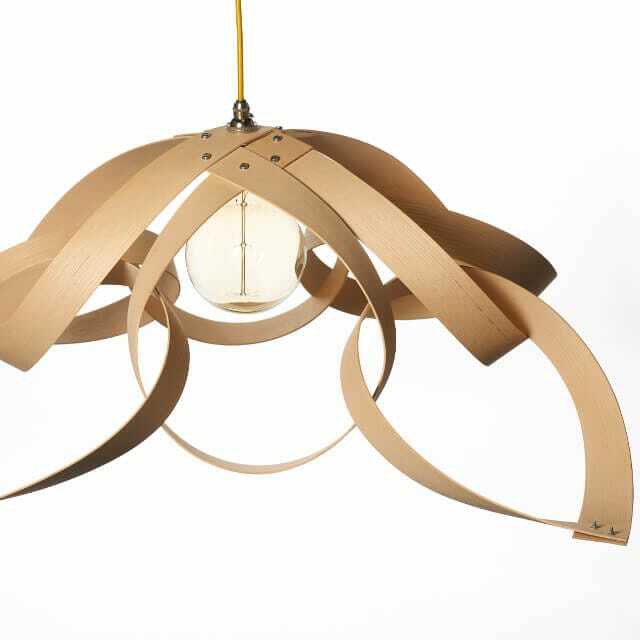 This wooden overhead light is constructed in ash which is steam bent by hand to form this unique piece. This clever design calmly reflects upon two seasons in the Cairngorms national park, Spring and Summer, its form can, in turn, be presented to represent each. In YB8 the spring formation presents us with a seductive closed form resembling a bud waiting to bloom. By simply moving the four lower tears 180 degrees this light swiftly turns into its summer formation YB8.5, a dramatic open shape that symbolizes the flora and fauna in full bloom. 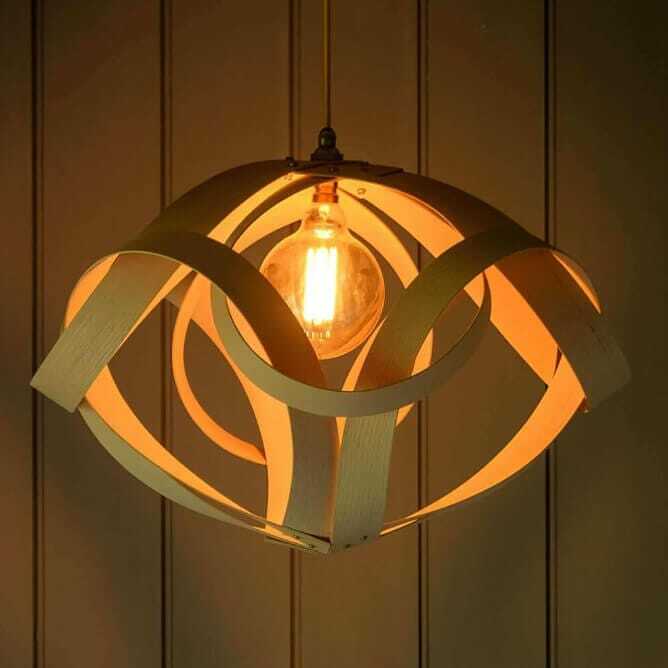 Hanging from your choice of coloured silk braided cord and high-quality chrome fitting an oversized edition squirrel cage filament bulb emphasis both forms. Each is dramatic in their own right casting their own calming shadows onto its surrounding walls. This light can be hardwired into your existing light source /ceiling rose or hung from a ceiling hook with a standard plug. Supplied with 1.5 m of cord, this popular light looks super with a long statement draped cord, extra cord is available upon request. Please tell us if you would like extra cord included in the comments box at checkout when you place your order. Ash with a quality chrome or brass fitting and choice of coloured silk braided cord. Yellow Broom is a collaboration between Edinburgh Collage of Art graduates David Robson and Clare Waddle. We both studied Sculpture so we suppose you could say our background is in visual art. As the years passed we were both moving more towards the design sector. A joint fascination with the visually attractive, simple yet functional object brought us together to co-design and create a range of wooden lighting. The highlands provide the ideal place to breathe in the air, observe and realise clarity of mind unpolluted by the speed of the city, here for us the mind becomes a freer place, the perfect choice for a creative. Inspiration comes daily from the simple distractions of the surrounding area . We work through the medium of lighting, we live with light and dark everyday, as artists the chance to explore its endless possibilities through an object of design bring a new and fulfilling creative process to us both. Yellow Broom has a zero waste approach to making, we try where possible to waste nothing. Most of the wood used to create our lights is sourced locally from sustainable forests in our area. Our off cuts are used to make our signature wooden business cards, this gives a little bit of the product to the recipient which is often recognizable as being from a particular light. It's great to see a person standing under one of our lights with the wooden card in hand and tell them of its journey. It is our aim that all larger off cuts go towards making one off products as the pile dictates, YB15 is an example of this, this light is mainly a byproduct of YB13.5. 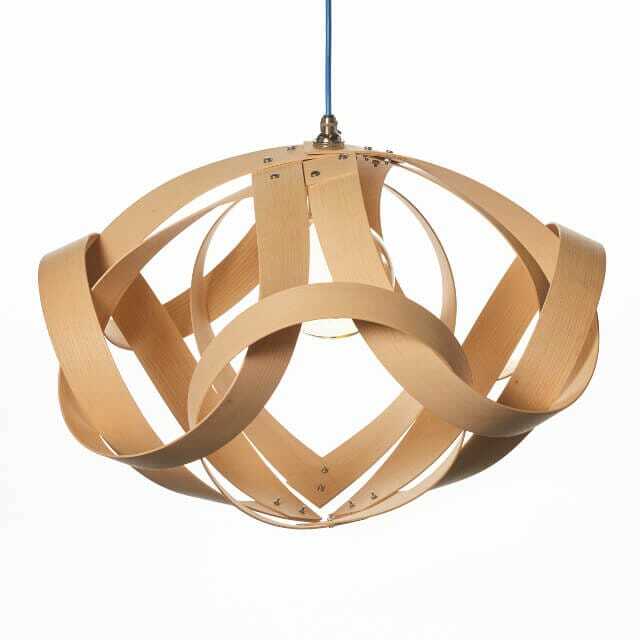 The waste wood shavings from the hand turned pendant shades are used as packing for all of our lights. We are currently in the process of exploring the possibilities of converting wood dust into a future product. Any wood that is unusable through shakes, staining, warping etc helps run our heating system. We heat our workshops, croft and hot water solely from wood. We incorporate sustainability into the design and making process through material choice, choosing our materials responsibly. Our timber supplies are from sustained forestry and local estates while windblown trees give us our main source of hardwood.